These are books (and movies) that have had an impact on me, and I think you’ll find something special in them. My Book! Not a travel guide. This book is one of the best on Buddhism! Simple e interesante perspectiva Tolteca. Interesting conclusions in this book! What can I add about Dostoevsky’s work? Or about Victor Hugo’s work? Food for thought in these movies. How they control third world countries, in particular. The Federal Reserve is a scam, is a private organization. It is a dream! It can be changed! Something about gun control that makes sense. ABOUT GUN CONTROL IN 99 WORDS! Gun-control laws do not control crime because crimes are not committed by guns; they are committed by criminals. Criminals will always have guns because they do not obey laws, including anti-gun laws. Those without guns are easy prey for criminals with guns. Gun control encourages crime. The right to bear arms was included in the Bill of Rights, not to deter crime, but to deter oppressive government. Just governments honor and protect the right to bear arms. Oppressive governments fear and prohibit the right to bear arms. Guns are dangerous. The only thing more dangerous is not having them. Tony the Vet is planning to walk from San Diego to New York. He will start on September 11, 2010, and is planning to arrive Sept. 11, 2011. He will be promoting and raising funds for SOVA (Support Our Veterans Association). Anthony A. LoBue, wartime veteran and founder of Support Our Veterans Association, is making a skydive from 13,000 over San Diego to launch his fundraising walkathon across America. LoBue will be making his skydive at Skydive San Diego on Friday, August 13, 2010 to help generate awareness about the Walkathon. 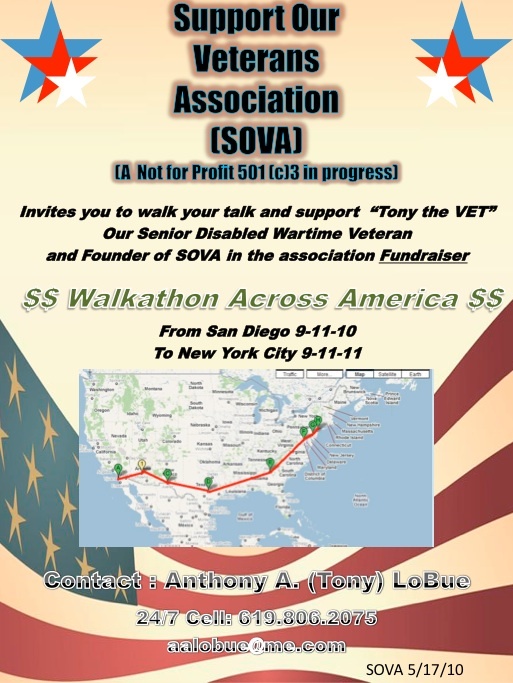 The SOVA Walkathon across America will begin on 9/11/2010 in San Diego, traveling through Phoenix, Austin, Atlanta, Philadelphia, and ending in New York at Ground Zero on 9/11/2011. For more info, check out his website at www.tonythevet.org or contact him directly at 619 806 2075. Welcome 2:00pm Pledge of Allegiance National Anthem (sung by Lee Satterfield) Chaplain Robert Satterfield USMC – RET: Invocation and Memorial Service for the Unknown Soldier 82nd Airborne Honor Guard, Color Guard & Bugler POW MIA Remembrance Ceremony Speakers: Congressman Bob Filner, Tony the Vet, TBD Door Prize Opportunity Drawing: (Donations processed by Veterans Museum & Memorial Center) Patriotic Sing-Along (led by Lee Satterfield) Benediction: Chaplain Satterfield Send Off 3:00pm Tony the Vet leads the first day’s walk of Walkathon Across America to Fort Rosecrans National Cemetery. I will also be announcing my petitions for proposed bills at national and state levels. We will be honoring Affiliates, Sponsors, Donors, and Volunteers. Put on some walking shoes and join me. 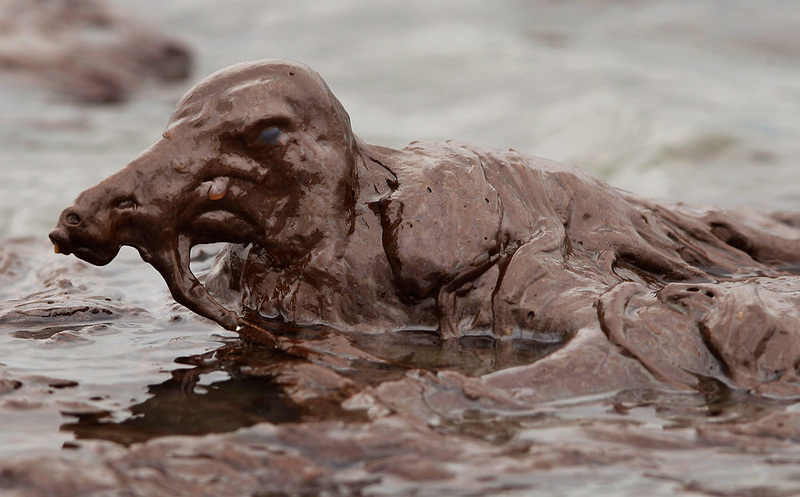 This website I found lets you visualize the spill if it was in your area, and keeps you informed of what is going on and what can you do to help. I was aware of this in a way. I had read about it. But politicians are so good at deceiving us, aren’t they? I heard President Obama talked about bailouts, and the federal reserve system, and how they would solve the recession problem, and I believed him. It made me feel that the federal reserve system was real. But I guess we have to face it; we are being conned. I just came across the book by G. Edward Griffin, The Creature from Jekyll Island, A Second Look at the Federal Reserve. And although I haven’t finished the book yet it seems to be very well documented, a must read for all Americans. It seems that our own government in association with a banking cartel (it is not federal and there is no reserve) is financially murdering the middle class and leading the world into chaos. It may be time to change our course. A country that leaves the control of its money supply in the hands of a few bankers is not a free country. It is interesting to note, however, that the con-men are also being conned. The ego makes us believe that we can profit by deceiving others, but everything is interconnected. At the end they will also be swallowed by the maelstrom they are creating. It is unavoidable. If you follow this link, http://www.bigeye.com/griffin.htm, and scroll down, you will find an excellent excerpt from the book. Be aware and awake.